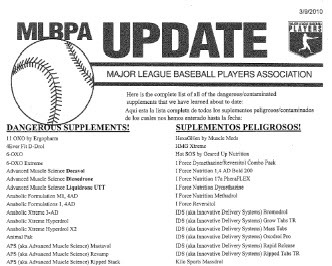 Since Congress wonâ€™t protect youâ€”or major league baseball playersâ€”from dangerous supplements, the Major League Baseball Players Union has just sent out a list of 104 supplementsÂ its players should avoid. The union terms the supplements â€œdangerous/contaminated,â€ in a clear an attempt help its players steer clear of substances that would falsely test positive for performance enhancing drugs. 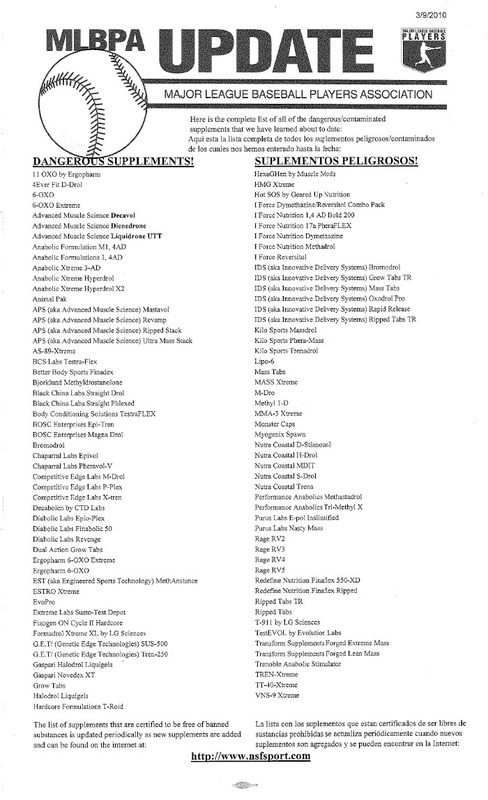 A previous version of this listÂ distributed to players was called â€œNon-Exclusive List of Potentially Contaminated Nutritional Supplements,â€ but it only listed 21 supplements. The list was circulated Tuesday, a day after John McCain withdrew support for his own bill that would have required supplement makers to list the ingredient of their products on their labels. The bill also would have required supplement makers to report adverse effects from using their productsâ€”including little things like liver failure, heart attacks, and deathsâ€”which they currently donâ€™t have to do. All four professional leagues and their unions have been pushing for years for the kind of legislation that McCain just killed. Over at Digg.com, several readers of my story on McCainâ€™s flip flop wrote that I was sensationalizing the issue, insisting that supplement makers would never put illegal or banned substances in products that are easily purchased in health food stores and over the internet. Clearly, the baseball players union disagrees. A brain food supplement of the best kind. But haven’t “protein” supplements been a source of steroids for a long time? Is it disengenuous to say that using them leads to a “false” positive? And if not, what are the ingredients that are legal and risk free that legitimate diet supplements offer? How do their benefits compare to those that are illegal? Questions from the wimp sector.